The Mikoyan-Gurevich MiG-17 is the follow-on of the more famous MiG-15. It was designed to fix any combat problems found with the MiG-15. The result was one of the most successful jet fighters prior to the introduction of true supersonic planes. The MiG-17 is longer than the MiG-15 and was the first use of an afterburner in a Soviet fighter. 8000 MiG-17's saw service from the early 1950's through the 1970's by twenty countries. 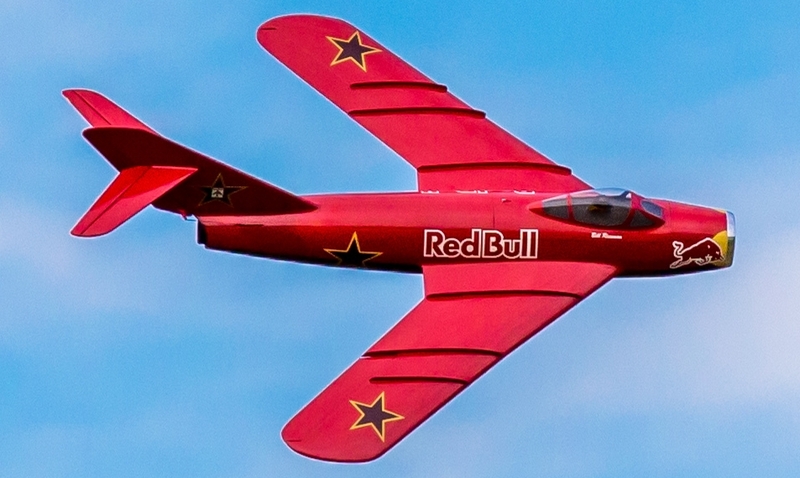 There are almost 30 privately owned MiG-17's in the United States, with several pulling airshow duties. This MiG-17 is designed around the Great Planes 56mm Hyperflow EDF unit (GPMG3910) and the Ammo 24-45-3790 brushless motor (GPMG5185). This economical setup gives 100mph plus performance on a 4S 2200mAhr LiPo battery pack. The goal with this design was to have a full ducting with no cheater holes for a clean scale appearance. The outline is true to scale with the exception of slightly larger ailerons and the stab is moved forward a bit to avoid a split rudder. This model requires some building skill to complete the fully planked fuselage, but further requires intermediate to advanced piloting skills to handle the high speeds that this model is capable of. Featured as a construction article in the February 2015 issue of Model Airplane News, we now offer a short kit of laser cut parts, vacuum formed canopy, printed plans, and photo illustrated manual (by download). Wing Area: 208 sq. in. Wing Loading: 20 oz./sq. ft.